it's been 10 years since I came to Sofia first time. not enough sleep 2 nights though, I managed to arrive 8 AM to join to bus tour with students to hiking george,,,What a great view! Oh, Serbian mountains are just nearby! Shall I cross there by foot?? ,,CS-host and I came back home with tiring after 8 PM though, from 11 PM we went to center, to join "museum night"
.Next host and friends took me to evening walking in south park,,,What a green city! .Wake up in the morning by strange feeling that "Why and From when I've been in traveling??" I phoned to last host in the morning but no answer so I visited directly but "Hey Ushi, What's happn!?" 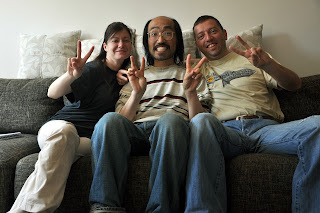 .meeting with Japanese CSer who is living in Sofia. .visiting next host 7pm, "Wait until my job will finish at 9pm",,,alone in old funiture room,napped with strange dream of "Why and From when I've been in traveling??" .Great meeting with host's friends. price of bus to Varna,30 leva(15 euro), price of prostitute on the street is also 30 leva(15 euro). .Next host's gallery's concert' event. Host asked me to pay entrance fee, so I left there. surfing CS-hosts in village near Vitosha mountain but it's still Sofia city. visited Vanya again,,I've still found main charactetr in Sofia-chapter only her (for example Minsk-chapter was also for 2 weeks but main person were 3 people,,) I admitted myself that I'm exhausted by everyday's CSing without break-day, and I gave up to go somewhere festival outside of Sofia, I realized that I don't need not only sightseeing or else but also any festival or else, seems that I'm realy enough to meet someone and visiting and hitchhiking,,I don't think I can show something special in my blog,and I don't take photos. .Finally finished sending CS-mails to Sofia even if not all of members though, but I still haven't replied to invites from Greek CSers, can't decide I will go to Macedonoa first or Greece?? Eventually I contiued to stay at Vanya's home with key although they had gone to trip. .Happily meeting with "religious scientist" but lovely girl of CS. .Please don't kick me out in the morning at least, even if I know you didn't mean to kick me out. .I have to leave Bulgaria very soon though, still can't decide which should I go Greece or Macedinia? 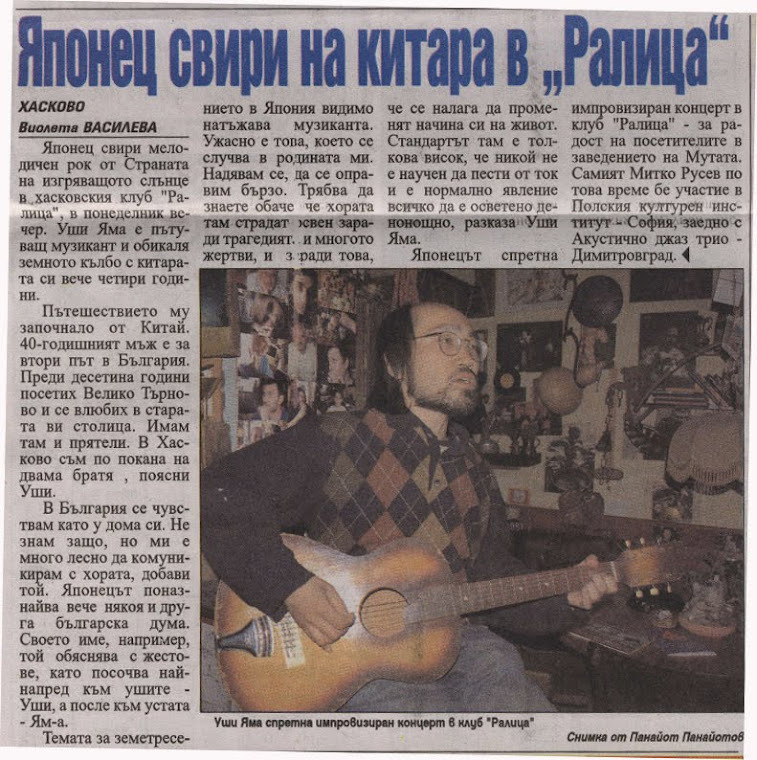 .Vanya had a guitar! nice but too old to play to audience. After all, I left Vanya's home 5 PM, then I was involved evening rush hour in bus. then she asked me about Scandinavia, and showed me her book of Moomintroll. .Hungry again,,Don't they eat food? ,,stayed at host's flat till noon, still hungry,,Don't they eat food? .Today's host is living in magical house with green tree but in center of capital city. .Meeting with CSers in park,,but I had no energy and got depressed again, nothing I spoke words. .I might should have finished CSing in Sofia in a week,,,?? All of Sofia' CSers whom I've been contacting couldn't host me tonight. Thanks, anyway I always prefer to go to Tiraspol firstly, if I can choose.